Audi A6 2.7 – 3.0 TDI released from 2004 to 2008 with V6 engines but it might be also applied on other Audi engine configuration models that have similar engine intake systems and engine setups, like Audi A3 – A4, – A5 – A8 – Q3 and Audi Q5 – V6 and V8 engines. 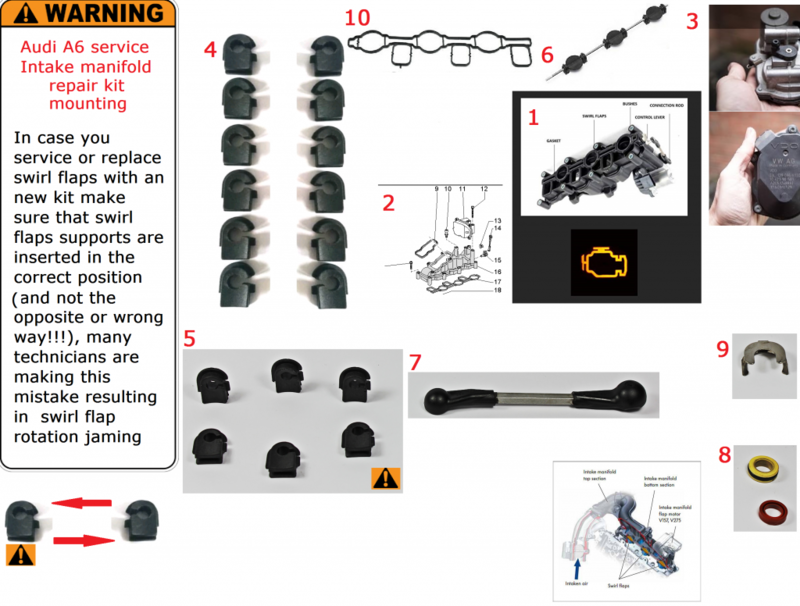 – P2011 – P2015 – intake manifold runner (bank 1 or 2) lower limit not reached error. If you don’t have a diagnostic device the check engine will light up in your gauge dashboard. Most common cause of this problem are the intake Banks that are defective or not working. Step 1 – Broken intake actuator or warn – Slow intake actuator MOTOR rotation. Once contact car key is inserted in cotact and turned in ON — In The normal driving position, intake actuator motors knobs will go up and down. – Release runner connection from both intake actuator motors and redo test procedure. If the intake actuator motors turning speed are different – than the slower actuator motor is broken = Replace Actuator Motor. If the intake actuator motors are turning at the speed, with runner connection off , than actuator motors are OK and you can Go to Step 2. 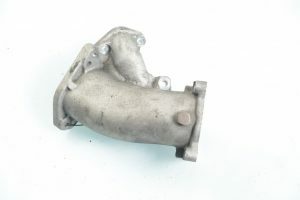 Step 2 – Intake manifold left or right runner BANK or SWIRL FLAP (1 or 2) is warn or broken (Once contact key is inserted and turned in ON position — In The normal driving position, intake actuator motors knobs will go up and down). – Check if there is any vertical or horizontal movement in flaps axles or if flaps supports are oval or warn. – Check for clogged holes or has carbon buildup deposits. Dew to the severe wear of “bank1” and “bank2” swirl flap manifolds found in 2.7 TDI and 3.0 TDI engines, control units will detect malfunctions accompanied with dashboard errors. As a result your vehicle will not function up to the OEM parameters. Among most common side effects are: higher consumption and CO2 levels, uneven idle RPM’s, impaired acceleration and de-acceleration. For Automatic Transmission models Cruise Control will struggle to maintain speed resulting in harder gear changes and low torque power. In case you service or replace swirl flaps with an new kit make sure that swirl flaps supports are inserted in the right position ( and not the opposite or wrong way!!! ), many technicians are making this mistake resulting in swirl flap rotation jam. intake connection is not clogged by carbon buildup deposit.